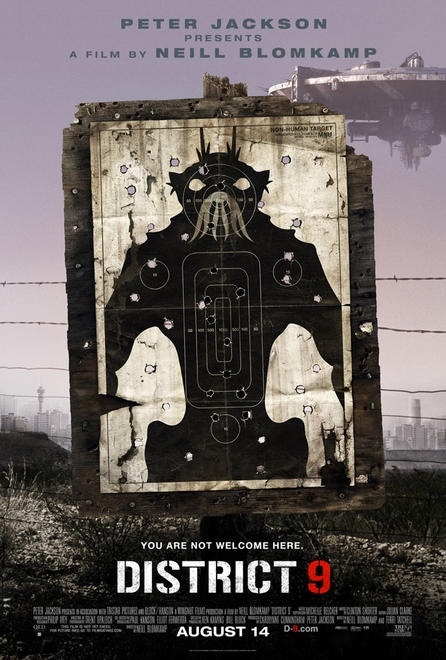 District 9 is a movie presented as a documentary being filmed in South Africa. 20 years ago aliens arrived on earth. Since then, they’ve been relocated into a slum, become a point of tension amongst the community, and become a problem nobody really wants to deal with. MNU, the organisation that has been set up to deal with the aliens, is embarking on a new project. They are going to demolish the slum and relocate the aliens to a camp well out of the city. Accompanied by heavily armed mercenaries, they descend on District 9 to evict the aliens. Science fiction has a rare gift. It enables us to say things about our society that we can’t say in any other genre. How the humans treat the aliens is a metaphor for how refugees are treated in our world. The aliens are treated the way I can imagine people run out of their homelands are treated in refugee camps all over Africa. But you’ll never see a movie about the subject act so raw and openly. The humans treat the aliens like they are animals, less than human. They refer to the aliens by racial slurs. Aliens are beaten and killed like they mean nothing. There is one scene where a hut full of alien eggs, their means of reproduction, are incinerated. The officials make jokes about the alien abortion. A civil servant is given a souvenir of his first abortion. Jokes are made about how the eggs set on fire sounds like popcorn. It’s sickening. Their attitude is evil wrapped up in red tape and politics. And this kind of thing is going on in the real world. About half way through the movie, the style shifts from documentary to a more straight up action adventure movie. The transition is pretty smooth and never lets up on the theme of the inhumanity of humans. At the end of the day, the aliens are merely resources to be exploited by others. They are not treated as sentient beings. They are not treated with love and compassion. They are merely things to be used. To the best of my knowledge, there is no extra terrestrial life on earth. Yet there are still those in our world that are treated in the exact same way. They are treated as less than human. They are kicked out of their homelands. They’re victims of daily brutality and violence. They have barely enough food, water and provisions to survive. This is going on in our world right now. And more often than not we remain blissfully ignorant. Our father God calls us to love all people. To look after those who are vulnerable in our world: the sick, the poor, the widows. District 9 reminded me that those of us in the developed world do a really poor job of loving those in the undeveloped world. Am I loving the refugee in Africa when I live a comfortable life and don’t do anything to help them? District 9 is a great science fiction movie. While violent and gory in parts, it will challenge you to think. As you watch the opening scenes, I challenge you to think of the aliens as human beings. Think of them as Sudanese refugees. Or any other people group in a similar situation. And then see if how you think about these people remains the same. Did God put you in any kind of position to help them? Do you have an African refugee somewhere in your sphere of operations? No? Me neither. You and I are both aware that such refugees exist, but if your situation is like mine, then neither of us know any refugees personally, or can name one specifically. They are not in our respective worlds. If we set out to help them anyway, then we are going out looking for trouble. If we go out to help some abstract refugee in Africa, then we leave behind the people around us who need help already. The people around us might not face starvation, but that doesn’t mean they don’t have problems that are important to them. Moreover, if our finding refugees to help is motivated by the guilt we feel over our own affluence, then our reasons are self-serving, and not based in love. That’s not to say all missionary work is fraudulent– I myself am in Afghanistan as I write this– but that we pursue the opportunities God places in front of us. If you or I don’t happen to be involved with African refugees, God may have a very good reason for that. If he chose for you to live in affluent Australia, there are reasons for that too. Lots of people there in Australia who need your help already, no need to beat yourself up over Africa. Thats an interesting way to put it Alamanach. I would agree with you I think, people do tend to feel guilty, especially Christians, for the lack of effort we do to help people in poverty in Africa. That is a good thing though I think. I think though that when the Bible commands us to care for the poor and needy around us, we don’t really have any extremely poor around us, so the way I think it would work in our culture is electronically, via internet or mail, to help the saints who are overseas serving Christ. And we are called to send the gospel to all nations, so the way I see it is unless we’re called there, we should “live as we are called” as Paul says and tell people here about Jesus. Its a difficult tension, helping those over there who need food and Christ or those here who need a wake up call and Christ. I liked ur post too Joel! I was just wondering what you thought about Christopher ascending, one day to return with an army. Christ symbol? And what about Viccus? He went through quite a big metaphorical and literal transformation. Its a powerful metaphor for the Christian life I think. Carlin: It’s been a while since I’ve seen this movie (wow, almost 2 years) so my memory is a little hazy. I do remember feeling like Christopher’s return had a Christ like appeal to it. However, there was a lot of uncertainty about it. Will he actually return? And will be bring vengeance? Which is different to Jesus as we know he will return and that he bring not vengeance, but justice. With Viccus’ transformation, it had it’s moments, but I really struggled to believe that his inner transformation was real and not just forced for plot reasoning.